From this strangely named location comes an even stranger tradition. It began in 1723 when the Delaware Indians settled in a place they called “the town of the sandflies.” Of course, they used their native language; it was called “ponksad-uteney”. There they told the stories of Wojak, the groundhog, who they believed to be their ancestral grandfather. Then the White Man came. It was also the 1700s, and they brought one of their traditions with them – Candlemas Day. Candlemas Day had its origins in the pagan celebration of “Imbolc”. To the Romans, this time of year midway between the Winter Solstice and the Spring Equinox was time for purification. Superstition held that if the weather was fair on this day, the second half of winter would be stormy and cold. For the early Christians in Europe, it was the custom on Candlemas Day for clergy to bless candles and distribute them to the people in the dark of winter. A lighted candle was placed in each window of the home. If the sun made an appearance on Candlemas Day, an animal would cast a shadow, thus predicting six more weeks of winter. Germans watched a badger for the shadow. In Pennsylvania, the groundhog, upon waking from mid-winter hibernation, was selected as the replacement. This observance went unnoticed for several years, but on February 2, 1886, Pennsylvania officially celebrated Groundhog Day. “The town of sandflies” had grown up and the White settlers had changed the name from “ponksad-uteney” to Punxsutawney. On February 2nd, 1886 there was a proclamation in The Punxsutawney Spirit by the newspaper’s editor, Clymer Freas: “Today is Groundhog Day and up to the time of going to press the beast has not seen its shadow.” The groundhog was given the name “Punxsutawney Phil, Seer of Seers, Sage of Sages, Prognosticator of Prognosticators, and Weather Prophet Extraordinary” and his hometown thus called the “Weather Capital of the World.” His debut performance: no shadow – early spring. 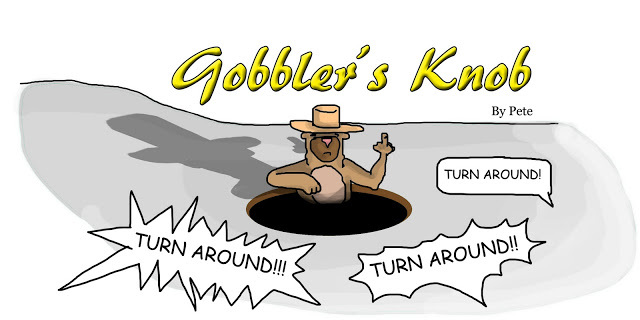 Since Punxsutawney was a populated area, groundhogs had moved to the quiet countryside long before this, and so the hunt for the groundhog the following year brought the people to Gobbler’s Knob, where Punxsutawney Phil has been declaring the weather ever since. What’s the record, you ask? According to StormFax.com, by 2011, Phil has seen his shadow 99 times, saw no shadow 16 times and no records were available for nine appearances. Unfortunately, Punxsutawney Phil’s predictions have been right only 39% of the time. I have my own way to determine when spring will arrive. If Punxsutawney Phil sees his shadow, we’ll have six more weeks of winter. If not, spring will arrive in a month and a half. By the way, the White men also confused the Delaware Indian’s ancestral grandfather’s name. Wojak became Woodchuck.